YOU ARE HERE Home East Africa East Africa Adventure Kenya, Tanzania and Uganda Combined Safari. Early morning pre- breakfast 'Spice' game drive at 6.30am, when you have the best chance to see Mt. Kilimanjaro. explore Amboseli in the morning hours as you transverse to the Boarder between Kenya and Tanzania in Namanga, on arrival you will go through the migration office and just in case you did not have a visa you can get one at the border. Then proceed to Arusha arriving late afternoon with a drop off in Arusha Tourist Inn Hotel for dinner as you wait to leave the following morning. Depart after breakfast and drive to Arusha International Airport (KIA). Fly to Entebe Uganda and upon arrival our driver will be waiting for you to transfer you to Kampala Africana Hotel for dinner and overnight on half board. After breakfast, drive back to Kampala with an en route lunch at Lake View Hotel in Mbarara. Transfer to Entebbe or Kampala hotel as you plan for your next destination. 1: Round trip transportation (Pick up and drop off to/ from your Nairobi Hotel. 2: Game viewing in custom made Mini- Safari cruiser. 3: High altitude game viewing at the tree lodge. 4: Multi-lingual Professional Safari Guide/Driver. 5: Twin/Double bedded rooms with private bath or shower. 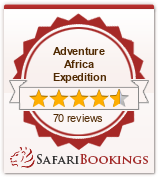 6: Guaranteed departures for two or more passengers booking this safari. 7: Membership in Flying Doctors Society - Emergency air rescue from any point of the safari circuit. 8: 3 meals a day while on safari. 10: Bottle water while on safari. 11: All Game Park fees. 12: A visit to an authenticate Samburu Village or a Masai Village.